Your marketing messages live in a crowded world. Online. On social media. On TV. On posters. At the cinema. In newspapers and magazines. In the mail. On petrol station forecourts…the number of routes through which we receive marketing messages is huge. The widely quoted figure that the average person is exposed to 5,000 messages a day is probably an urban myth. But, the total is still enormous. And the truth is that, whatever the figure, your message is just one of many that your potential customers will see each day. Most of these messages will be ignored. So, how do you get your message to stand out? Being seen in the right places is a good start. 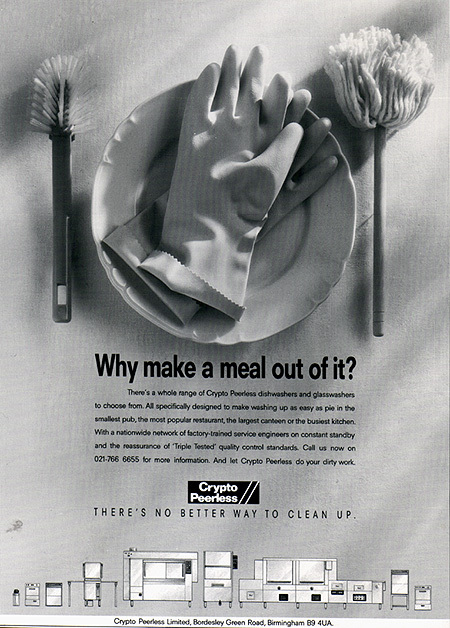 Take these advertisements for Crypto Peerless, manufacturers of a vast range of professional catering and dishwashing machines for the catering trade. Clearly, the ads would have been lost in a consumer magazine or a newspaper. They simply would not have been relevant to the vast majority of people who saw them. 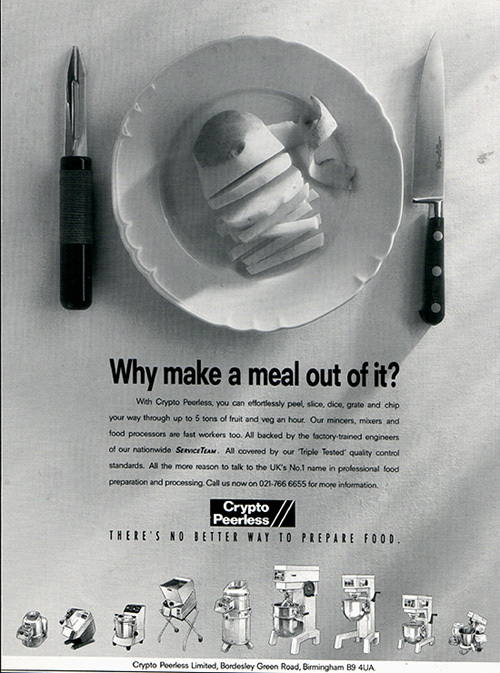 The trade press in which these advertisements appeared was chosen because it was targeted at customers who would find these products useful and relevant. The problem: virtually every ad for any type of machine looked exactly the same. See those illustrations at the bottom of these ads? Imagine those in a small box on a page, along with a lot of other boxes featuring other machines. Boring. Pointless. Invisible. So, rather than try to advertise individual machines, these ads promised to make it easy to find whatever type of machine you needed. These days, of course, press advertising would form only part of the messaging. But, you can easily imagine how this simplified proposition would work well as a website landing page, an online banner and an e-mail flyer. Here’s a short video I shot for a good cause close to my home. Nothing unusual there, you might think. Except I did all the filming, sound recording, editing and final production myself. I learned a lot in the process. Sometimes it’s good to get out of your comfort zone.